The game starts out slowly in a castle with no immediate threat, allowing you get your bearings. This is still exciting because you get to jump around and discover how damn smooth the gameplay is. The game’s movement is remarkably polished like a classic SNES game. The game is very responsive, and I noticed this even in the menus. It perhaps has the least input lag of any Switch game I’ve played. In addition to a great feeling and response time, the pixelated graphics have a “warm” feeling of depth that looks great in motion. This game is legit and almost immediately after moving my character, I was happy that I gave this game a chance. I set out from the castle to begin my journey. People needed help in a town down the road. The place took my breath away as soon as I arrived. I walked around and took in the snowy mountain air with some mellow acoustic guitar strums. After discovering that the houses in this town were deserted, I started my descent into the mines. Oh look, enemies! At last, a test of my knight training. My sword made a satisfying crunch against this ghoul looking fellow. That seemed to take care of it. Oh yes, classic combat. I took a few hits just figuring things out, and my health was now down to 30HP. I smacked some lights and enemies to try and get HP back but to no avail. Hmmm, I’ll just have to be careful until I figure out how to get health. A few more enemies in the way, better be carefu- LEVEL UP! Oh, sweet. Looks like my health refilled to max. I opened the map and tried to figure out where I was going. A ton of unexplored rooms and no hint yet as to which direction held any answers. The goal is find all the missing people from the town and solve the mystery of their disappearance. It’s a nice “normal” objective compared to blowing up a planet in Metroid or fighting the 100 year rebirth of Dracula in Castlevania. Okay, time to focus on exploring the mines. I will just head west until I find a dead-end I suppose. I smashed some boxes and got Grapes and Iron Ingot. I couldn’t use the Iron right now but it appeared the Grapes were able to heal 17HP. Nice. I might just hold on to them for now… I’m pretty sure I’m almost leveled up so I can just save them and restore health that way. It turns out that restoring health is a matter of using held items, and later on you get potions and such to use. Looks like I can equip this Club for a nice attack boost too. Combat in this game strikes a nice balance between being challenging and comfortable. Enemies start off fairly simple, but develop a good variety of patterns. Some you need to jump over, some will punish you for jumping, some you need to backdash as they strike. 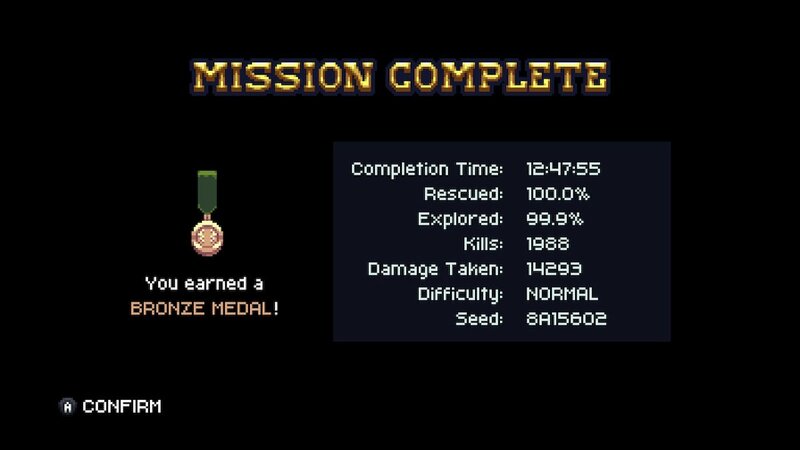 The game has multiple difficulties but playing on “Normal” struck a good balance for me, just enough challenge to keep you on your toes. The game has some pretty fun boss fights too, nothing too spectacular or creative but a nice challenge. There are multiple ways you can prepare for a tough fight if you are finding something too hard. Upgrading weapons, leveling up, finding food. The game lets you hold onto a lot of healing items to just spam during a fight so essentially you can brute force kill anything. It’s up to you if you want to master enemy patterns or break the game open with the right items. When you get into a rhythm with the combat, it becomes very enjoyable to simply go through rooms and navigate the map. Casually slaying enemies, grabbing ledges, jumping over gaps, all feels great when accompanied by some good music. Most of the music in this game is pleasant, while not being overly melodic. It relies on rhythm quite a lot and isn’t the greatest soundtrack ever for the genre, but suits the game very well. The bassline bounces off the walls in the mines as you strut across the screen slaying enemies without stopping. The game just feels good to play with its combination of great movement, warm artstyle and cool music. Chasm’s biggest accomplishment is retaining a very distinct identity through all the randomly generated exploring. The village slowly populates as you rescue people from the mines, and some of them offer services to help you on your journey. There’s a new bit of dialogue from the Mayor of the town after every new villager you rescue. It’s just worth a walk around town every now and then to get your bearings and see how everyone’s doing. When you come up for air you feel like you did something. Why can’t Chasm crawl? The game slowly gives you new abilities that in turn open up new areas for you. Ah, the classic Metroid progression. Oh wait, this game is randomly generated right? Chasm does a good job “hiding” the flaws of randomly generated design, but ultimately falls into some of the same traps. My biggest issue is that backtracking can start to feel a bit repetitive near the end of the game when a lot of rooms look so similar. It’s mainly the backgrounds that are repeated, which some games can get away with but compared to other masterpieces in the genre like Hollow Knight, the visual design feels a bit flat. For the most part though, I completely forgot it was randomly generated and wouldn’t have even guessed if I didn’t know beforehand. They did such a great job with that it actually feels fully designed. There are progress barriers in the right spots, and I didn’t find a single glitch or soft-lock. A lot of randomly generated Indie games are simply combat orientated, but I found that basing it on exploration was a lot more engaging. That could just be my personal tastes though because a lot of people loved Dead Cells, but I can’t get into it. My seed number for my completed game was 8A15602 if anyone is interested in playing the same experience I had. Probably better to create a brand new one though. I started a second game just before writing this review and everything is the same up until the mines. Even in there so far it’s not too different. Chasm is a rather quiet game without much buzz, but it’s one of the best Indie games I’ve played on Switch. The movement feels great, controls are good, exploring is fun, and the scenario has a nice dash of personality. The story and lore is not too extensive, but it’s enough to create an interesting game world. I recommend this game to anyone who has nostalgia for the handheld Castlevania series and wants a slow-paced journey through some new environments. With it’s comfy style and intriguing progression, it makes for a very comfy playthrough and suits the Switch very well. If there’s one new thing Chasm brings to the formula, it’s not in the gameplay or story, but the overall tone. Quite a lot of these games are stressful, but this one maintains a serene feeling. The feeling of danger is replaced with curiosity in this game. The final area is actually quite hard, but there are dozens of tools to deal with the hazards. You can always just level up. Chasm is best enjoyed the same way I would recommend any Metroidvania, at your own pace.